The Durham Bulls return to the DBAP for a six-game homestand on Tuesday, July 4, as the stretch kicks off with an Independence Day Fireworks Extravaganza. Additionally, the week will also feature a pair of USA Baseball games, an evening of $1 Concessions, two more fireworks shows and Military Appreciation Night. Prior to the Bulls kicking off their homestand, Team USA will play a pair of contests at the DBAP. On Saturday, July 1 future MLB stars will take on Chinese Taipei at 6:35 p.m., and on Monday, July 3 the Stars and Stripes will play Cuba at 6:35 p.m. Following the contest against Cuba will be a fireworks show, kicking off the Independence Day celebration. Tickets to the USA Baseball contests can be purchased here. 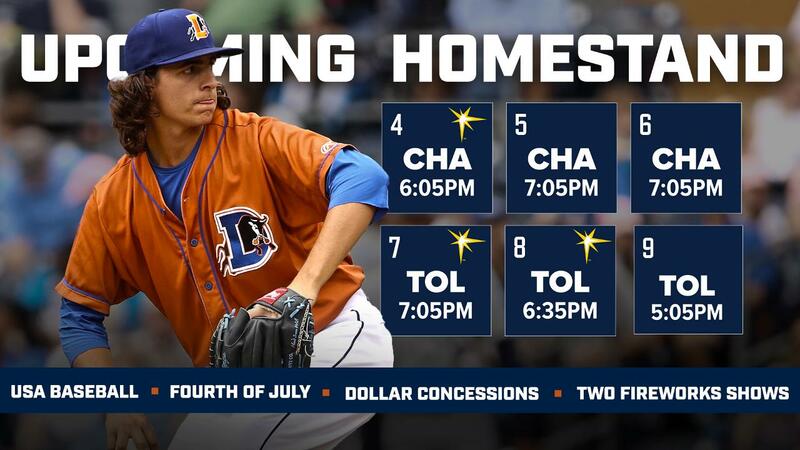 On Tuesday, July 4, the Bulls return to Durham to open a three-game series against the Charlotte Knights at 6:05 p.m. Following the contest will be the City of Durham's official 4th of July Fireworks Show, as pyrotechnics will light up the Bull City to celebrate the national holiday. The Bulls battle the Chicago White Sox' top affiliate at 7:05 p.m. on Wednesday, July 5. To celebrate 7/5, fans can purchase Terrace View and Outfield Reserved tickets for just $7.50 plus taxes and fees by using the promo code JULY5. Fans can purchase the discounted tickets here, and the deal is only valid for advance purchase only. The series against the Knights comes to a close on Thursday, July 6. The 7:05 p.m. contest features $1 Concessions, as throughout the evening Bright Leaf hot dogs, soda and popcorn are just a buck. On Friday, July 7 the Bulls welcome the Toledo Mud Hens to the DBAP for the opener of a three-game series. The evening's 7:05 p.m. contest is presented by QuintilesIMS, and following the game will be a Friday Night Fireworks show presented by bioMerieux. On Saturday, July 8 the Bulls and the Detroit Tigers' Triple-A affiliate meet at 6:35 p.m., with the evening's contest presented by Blue Cross Blue Shield of North Carolina (Blue Cross NC). After the game, the DBAP will once again be treated to a fireworks show, presented by JT's Landscaping. The homestand comes to a close on Sunday, July 9 at 5:05 p.m. with Military Appreciation Night, as the team will honor those who have served. Following the game children get to show off their speed with Kids Run the Bases presented by Nature's Twist.